Located just outside the bustling city centre, in an area which retains its Victorian feel in terms of street architecture, Absinthe Salon is a must visit for steamy residents of the metropolis and travellers alike. Guests of Absinthe Salon enter a themed reception area/anteroom to gain access to an intimate bar room catering for a maximum of 30 seated guests. On arrival, guests press a period buzzer to gain entry at the pleasure of the host. Our host, Nathaniel, walked the fine line between geniality and period reserve with panache. Civilised greetings and pleasantries are exchanged in a themed anteroom. Patrons are then escorted to a table set for the enjoyment of a journey to visit with the green fairy. A laminated, double-sided single A4 page menu is provided from which patrons nominate their choices for first, second and subsequent rounds of absinthe. The only food on offer is a brie brioche. This offering is sound but is an easily omittable part of the experience. The laminated menu is perhaps the least authentic part of the experience. However, the capacity for wetting (and therefore, damaging) menus is an ever-present danger, an inherent ongoing reality for the establishment. Therefore, this small departure from offering a traditional menu is understandable. Effective mood lighting and a spectacular bar set up delights the eye. A mural depicting the green fairy herself is a feature of one wall. An atmosphere reminiscent of a Parisian salon with frequent steampunkish touches and replete with a salty bohemian crowd prevails. Surrounded by a sound selection of absinthes with the accoutrements necessary for its enjoyment in the traditional manner, guests are seated on black and white wicker chairs at round tables accommodating 4 comfortably. 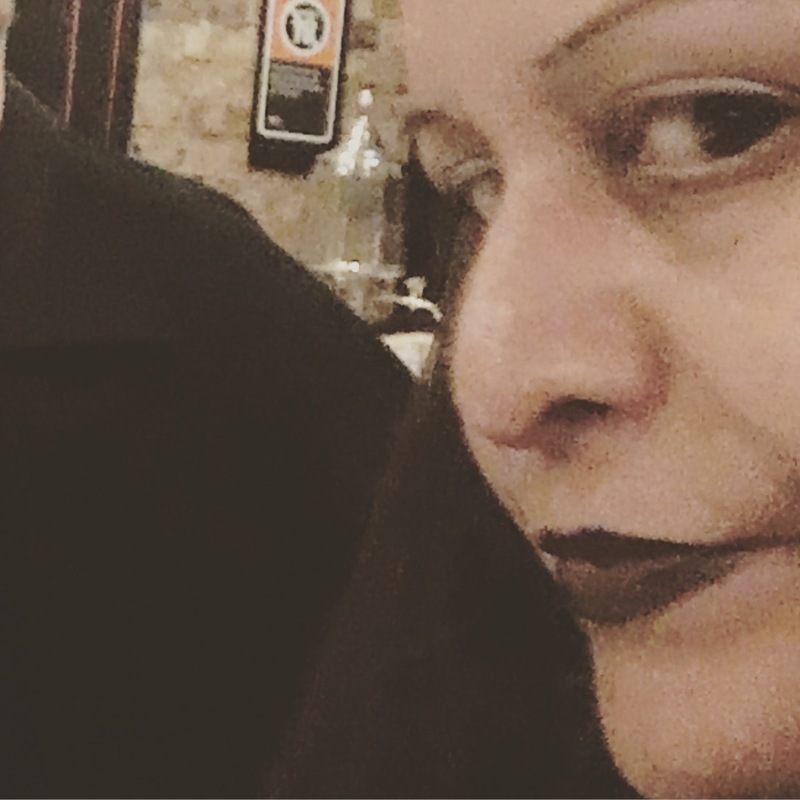 You can get moody at Absinthe Salon! Efficiency – we were seated promptly; the table was already set for 4 and given that we were a party of 3, the unnecessary place setting removed immediately; the four tap absinthe water fountain at the centre of our table was refreshed with ice water within moments of our being seated; we were presented with menus forthwith with an opening introduction as to how to read the menu. Timing – adequate time was given us to make our selection; we tended to linger over each glass for 30 – 40 minutes which seemed to present no issue to the host. 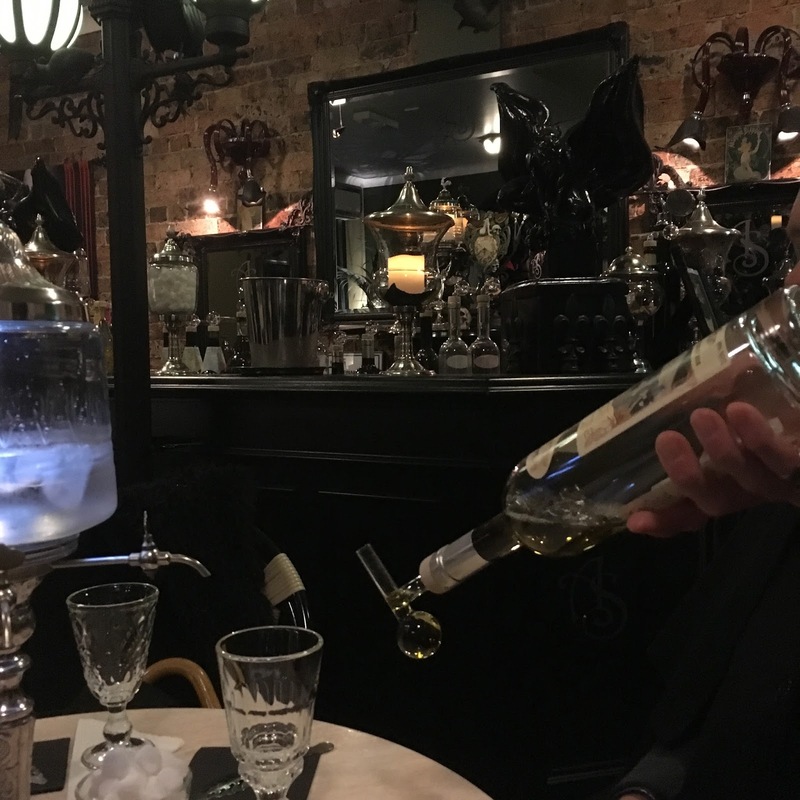 Product Knowledge – our host, Nathaniel, was well-informed about the selection of absinthe on the menu; the presentation of the material was entirely in character with the atmosphere one would imagine did prevail in early 20th century Parisian salons. Personalisation – Nathaniel, our host, was genial, professional and stayed entirely in character; the host sought opinions from each guest as to their tastes and the best matching absinthe or set of absinthes then recommended. Pace – our host, Nathaniel, set the pace and outlined the 3 drink maximum showing sound Responsible Service of Alcohol practices are in place, without rushing us towards us towards the maximum number of drinks; less potent, lighter absinthes are recommended for consumption first with progression to the more strident, character drinks taking place in the 2nd and 3rd rounds after establishing your tastes. 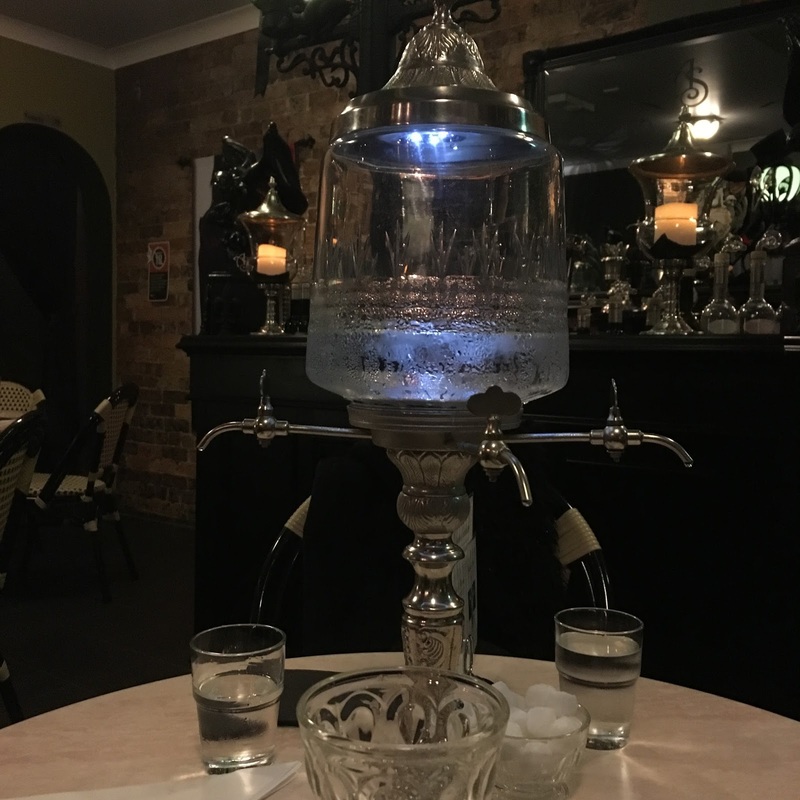 A water fountain adorns every table at Absinthe Salon, allowing guests to dilute their spirit to taste. Attentiveness – A chair was pulled out for the nearest lady by the gentleman host Nathaniel; a sharp yet unobtrusive eye was kept on when we may be ready to order a subsequent round of drinks. Absinthe Salon scores very highly on quality. The accoutrements of absinthe consumption – the water fountain, slotted sugar spoons, irregularly shaped sugar cubes, heavy cut glassware which adorned the tables (an eclectic, non-matching selection), the absinthe shot measuring devices attached to bottles which were reminiscent of a scientific laboratory all worked their charms. A quaint steampunkish touch: a shot pouring device attached to every bottle of absinthe, measured out at table. With a minimum price of $17 per absinthe, be prepared. However, the enveloping experience more than compensates. 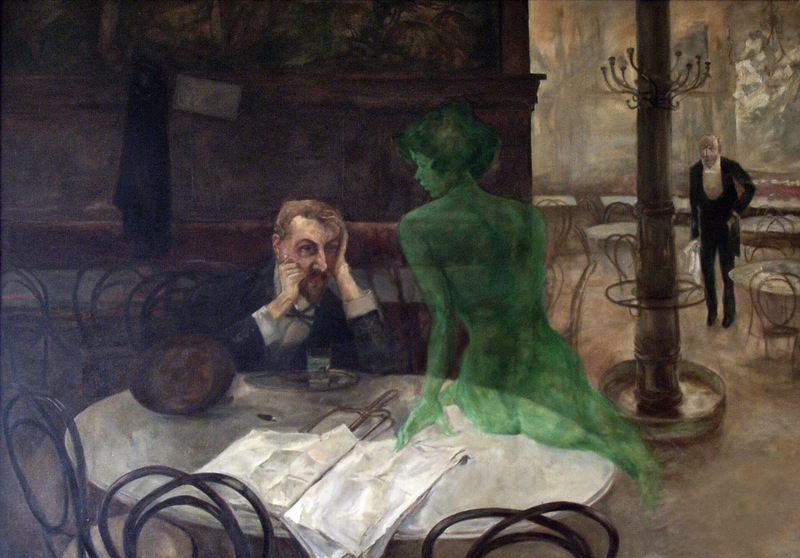 Originating in Neuchatel, Switzerland in the late 18th century, absinthe became popular with many writers and artists in late 19th and early 20th century Paris. The spirit was notably opposed by social conservatives and was prohibited in the US and most of Europe. Notions about the psychoactive and hallucinogenic properties of one of its active ingredients, thujone, were exaggerated; nonetheless, this reputation has added to its ongoing allure as has its association with notable figures which include Oscar Wilde, Aleister Crowley. Lord Byron and Henri de Toulouse-Lautrec. Oscar Wilde in New York in his favourite coat, 1882. Taken by Napoleon Sarony (1821 – 1896). Absinthe is a distilled, highly alcoholic spirit which is (according to Wikipedia) between 45-70% ABV / 90-148 US proof. It is derived from botanicals which include green anise, sweet fennel and other medicinal herbs. Commonly referred to in historical literature as “la fée verte” (the green fairy), it is commonly diluted with iced water when decanted, just prior to being imbibed by the rakish devotee. There are about 200 brands of absinthe produced around the world in the early 21st century: France, Australia and Czech Republic are amongst the absinthe maker pioneers of this new era. NOTE: This post originally contained an error in respect of conflating absinthe’s ABV (alcohol by volume) which is expressed as a percentage with the US proof (ethanol content). We graciously acknowledge the kind advice of Colonel Hawthorne whose knowledge of matters libational allowed us to rectify this factual oversight. Time to create a Sir Round-a-Sound…adding a working clock! My dear sir, thank you for this review. Some friends recently attended this establishment and their views seem to agree with yours. When next I find myself in Sydney, this will be a must. One small technical point regarding your 'History of Absinthe' section: 'proof' and percentage of alcohol are not the same thing. Absinthe containing 70% alcohol by volume is 140 degrees proof (or simply 140 proof) if one follows the simple American system; by the English system it is something like 122.5 proof.